Each of us has a host of tales to tell: memories that make us laugh or cry, memories that evoke sympathy, anger, joy or sadness. Why then is it so hard to recreate those emotions on a page?  “I just want to write so people will read my stories,” is a plea we often hear. Good writing – like painting, musicianship, or even carpet-laying – begins with learning. Our Finding the Unique writing workshops focus on skill development: prose techniques that immerse readers in your characters’ lives, so they experience the smiles and feel the tears, smell the perfume, touch your characters’ fur coats and taste their Sunday dinner. We teach these skills through doing, with in-class writing and feedback, inspiring prompts and examples. The classes are small and personalized, allowing us to focus on individual writer’s needs and challenges. Join us. Let the unique transform your narrative.